As we all know, we can enjoy popular favorite movie and TV shows on Hisense TV using various apps from Internet. Besides that, we can also enjoy our contents on USB Hard drive on Hisense TV thru USB port. However, like many other TV brands, Hisense TV provides limited compatible media formats and you may encounter format or codec incompaitibility issues when transfering some local media files to Hisense TV for playback. So you might need to know what video and audio files are supported by Hisense TV to make sure your videos on USB played smoothly on Hisense TV. Whether you have bought a Hisense TV, or ready to buy one, this post will give help you a lot. Read on for details. Part 3: Failed to Play Your Movies on Hisense TV? Solved! 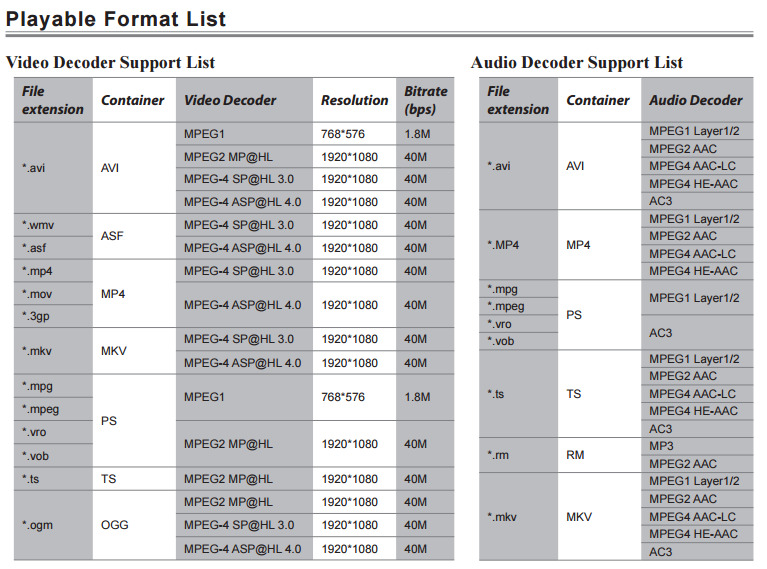 From Hisense TV User Manual, you can know the supported video formats of Hisense TV and the video and audio codec that can be decoded. If your movie format is in the supported list but there is something wrong when you try to play on your Hisense TV, you can operate according to the following methods. 1. No sound or picture. Check if the power cord is in the AC outlet and if it has electricity. Check if you have pressed [POWER] button on the TV or [POWER] button on the remote control. Check to see if LED light is either red or blue. If illuminated, power to TV is OK.
2. I have connected an external source to my TV and I get no picture and/or sound. Check for the correct output connection on the external source and for the correct input connection on the TV. Make sure you have made the correct selection for the input mode for the incoming signal. 4. Sound but no picture or black and white picture. If black and white picture first unplug TV from AC outlet and replug after 60 seconds. Check Color Setting if picture is black and white. 5. Sound and picture distorted or appear wavy. An electrical appliance may be affecting TV set. Turn off any appliances, if interference goes away, move appliance farther away from TV. Insert the power plug of the TV set into another power outlet. 6. Sound and picture is blurry or cuts out momentarily. If using an external antenna, check the direction, position and connection of the antenna. Adjust the direction of your antenna or reset or fine tune the channel. From the information listed above, Hisense TV supported video format is limited. Hisense TV only supports MP4, MKV, AVI, well. But the video codec should be MPEG-4, MPEG-2 and MPEG-1. If you have some MP4 and MKV files that encoded with H.265, DivX, XviD, they won't be able to playback on Hisense TV. In this case, the easiest and fastest way is to encode/re-encode the incompatible video files into Hisense TV compatible video with the right video/audio codec. There are many video encoding tools out there that allow you to accomplish the conversion. Handbrake, Freemake, Format Factory, etc. are all free video encoding tools that can help you transcode videos to Hisense TV. If you are seeking for the best video output quality, fastest video conversion speed, and the most formats supported, EaseFab Video Converter Ultimate will be your best choice. Also it has other features that will impress you! - Versatile video editing functions: rotate, trim, merge, split, watermark, effect, subtitles, etc. Step 1: Run the best Hisense TV Video Converter, then you can load files by browser or just drag and drop the video files to the software. This program supports batch conversion so you can load multiple videos to batch them. Blu-ray and DVD are also supported to imported easily. Step 2: Click "Profile" and select MP4 as the output format. 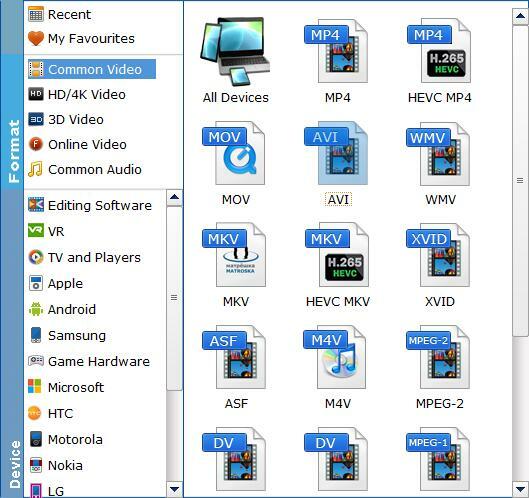 If you want to convert Blu-ray to MP4 for iPhone, iPad, Samsung Galaxy, Google Nexus, etc., you can browse to find any video preset as the output format. Tips: The default setting works well. Of course, if you want to customize video and audio encoding settings, just click the Settings button to customize these settings. You can adjust the output video/audio resolution, frame rate, bit rate, etc. to customize the output files to get the best quality you want. Step 3: After the above steps are done, you can click “Convert” button to convert your video to Hisense TV supported formats. Once the process ends, you can find the generated MP4 video in the output folder. Then you can transfer the video files into USB HDD and then play the video files on Hisense TV.